新鋪美佳と福留麻里により結成された身長155cmダンスデュオ。 155cm dance duo “Ho Ho-Do” was formed by Mika Arashiki and Mari Fukutome. 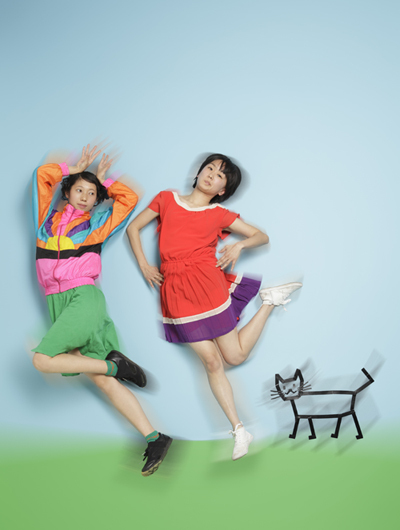 Ho Ho-Do 155cm dance duo “Ho Ho-Do” was formed by Mika Arashiki and Mari Fukutome in 2001. Their work is created through their delicate sensitivities and impulses they feel in everyday life based on the relationship between two by the interaction of various way of communication. They adapt not only ordinary dance techniques but also small, and some might say trivial gestures from daily life, as motifs of movement to create pieces showing their poetic world-view. Ho Ho-Do has performed their pieces in more than 20 cities through Japan and overseas. They have collaborated with a range of artists including playwrights and musicians, and they have delivered a wide range of workshops for young people and adults. Their recent site-specific series “Ho Ho-Do @***”shows their signature style of presenting work outside of traditional performance venues, instead setting up in ordinary places as an extension of ordinary daily life - in a house, on stairs, a corridor, a roof terrace, a café or at a street crossing. Ho Ho-Do has filmed their performances presented at these venues without prior notification, and updated on YouTube monthly since 2009. This repeated attendance at each place allows them to infuse their work with the essence of the space and the unique characteristics of each venue are reflected in the work – structure, history, activity, found items, sounds, people, the weather of the performance day or an unexpected chance encounter all feed into the work. In Autumn 2010, for their first anniversary of the Ho Ho-Do @*** series, the duo performed “Ho Ho-Do @ watching house” in a residential family home, creating a unique relationship between dancers and the audience by welcoming the audience into the house. This created a rich and unusual experience for the audience and such a relationship between performers and audience could not have existed between traditional stage and auditorium. Multimedia presentation of Ho Ho-Do’s work was shown alongside live performances in the house and audience members joined in with the dancing inside and outside of the house. The company strives to extend dance practice by experimenting with alliances. The “Ho Ho-Do x DJs ! !” series sees them collaborating with DJs and musicians to play different types of music for one piece of choreography.